Most pickup trucks come with a four-wheel drive system that helps drivers better navigate in the snow. This can also give the driver a false sense of security because they feel they can continue to drive at high rates of speed because the traction will be much better. Here are some important driving tips for pickup truck driving in the snow that will make certain you are safe and do not put you and other people on the road at risk. 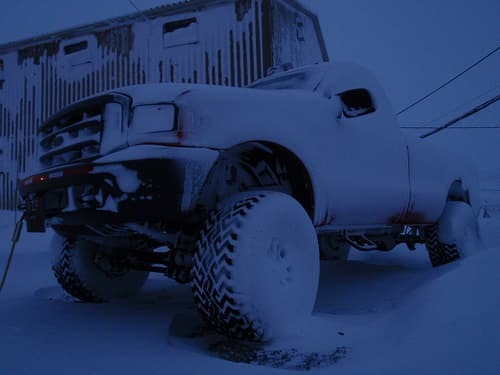 The four-wheel drive system is great for moving you through snow and getting you rolling if you are stuck. The one limitation of the four-wheel drive system is that it can not help you to stop. Too many drivers exceed safe driving speeds because they feel safer in the truck only to find out they can not stop in time when necessary. Practice driving your truck in an empty lot with a light snow covering so you can better judge the distance you will need to come to a stop. Getting familiar with the way the 4×4 handles the snow will make your driving experience much safer. When you begin to approach a curve in the roadway too fast in your pickup truck you run the risk of corkscrewing the front wheels which will cause the truck to continue to go straight rather than turn. Letting up on the gas pedal will auto correct the problem if you feel the truck not responding to the wheels turning. Trucks handle steep hills different that automobiles. When you begin to go down a steep hill move the truck into a lower gear which will in turn cause the engine to help the truck slow down. If the front wheels begin to slide it is best to shift the truck into two-wheel drive so the front wheels will continue to roll and the back wheels work to slow down the speed of the truck. The back of most pickup trucks are lighter than the rest of the vehicle. The automobile has a lower center of gravity so steering on snowy roads is easier. When driving your pickup on snowy roads if you feel the rear end beginning to fish tail you should turn the steering lightly in the direction of the slide and let of the gas until the truck can regain traction.